The great majority of the people ruled by Rome were engaged in agriculture. From a beginning of small, largely self-sufficient landowners, rural society became dominated by latifundium, large estates owned by the wealthy and utilizing mostly slave labor. The growth in the urban population, especially of the city of Rome, required the development of commercial markets and long-distance trade in agricultural products, especially grain, to supply the people in the cities with food. Agriculture in ancient Rome was not only a necessity, but was idealized among the social elite as a way of life. Cicero considered farming the best of all Roman occupations. In his treatise On Duties, he declared that "of all the occupations by which gain is secured, none is better than agriculture, none more profitable, none more delightful, none more becoming to a free man." When one of his clients was derided in court for preferring a rural lifestyle, Cicero defended country life as "the teacher of economy, of industry, and of justice" (parsimonia, diligentia, iustitia). Cato, Columella, Varro and Palladius wrote handbooks on farming practice. In his treatise De agricultura ("On Farming", 2nd century BC), Cato wrote that the best farms contained a vineyard, followed by an irrigated garden, willow plantation, olive orchard, meadow, grain land, forest trees, vineyard trained on trees, and lastly acorn woodlands. Though Rome relied on resources from its many provinces acquired through conquest and warfare, wealthy Romans developed the land in Italy to produce a variety of crops. "The people living in the city of Rome constituted a huge market for the purchase of food produced on Italian farms." Land ownership was a dominant factor in distinguishing the aristocracy from the common person, and the more land a Roman owned, the more important he would be in the city. Soldiers were often rewarded with land from the commander they served. Though farms depended on slave labor, free men and citizens were hired at farms to oversee the slaves and ensure that the farms ran smoothly. Grains.Staple crops in early Rome were millet, and emmer and spelt which are species of wheat. According to the Roman scholar Varro, common wheat and durum wheat were introduced to Italy as crops about 450 BCE. Durum (hard) wheat became the preferred grain of urban Romans, because it could be baked into leavened bread and was easier to grow in the Mediterranean region than common (soft) wheat.Grains, especially baked into bread, were the staple of the Roman diet, providing 70 to 80 percent of the calories in an average diet. Barley was also grown extensively, dominating grain production in Greece and on poorer soils where it was more productive than wheat. Wheat was the preferred grain, but barley was widely eaten and also important as animal feed. Olives.The Romans grew olive trees in poor, rocky soils, and often in areas with sparse precipitation. The tree is sensitive to freezing temperatures and intolerant of the colder weather of northern Europe and high, cooler elevations. The olive was grown mostly near the Mediterranean Sea. The consumption of olive oil provided about 12 percent of the calories and about 80 percent of necessary fats in the diet of the average Roman. Grapes. Viticulture was probably brought to southern Italy and Sicily by Greek colonists, but the Phoenicians of Carthage in northern Africa gave the Romans much of their knowledge of growing grapes and making wine. By 160 BCE, the cultivation of grapes on large estates using slave labor was common in Italy and wine was becoming a universal drink in the Roman empire. To protect their wine industry, the Romans attempted to prohibit the cultivation of grapes outside Italy, but by the 1st century CE, provinces such as Spain and Gaul (modern day France) were exporting wine to Italy. Other crops. The Romans also grew artichoke, mustard, coriander, rocket, chives, leeks, celery, basil, parsnip, mint, rue, thyme 'from overseas', beets, poppy, dill, asparagus, radish, cucumber, gourd, fennel, capers, onions, saffron, parsley, marjoram, cabbage, lettuce, cumin, garlic, figs, 'Armenian' apricots, plums, mulberries, and peaches. In the 5th century BC, farms in Rome were small and family-owned. The Greeks of this period, however, had started using crop rotation and had large estates. Rome's contact with Carthage, Greece, and the Hellenistic East in the 3rd and 2nd centuries improved Rome's agricultural methods. Roman agriculture reached its height in productivity and efficiency during the late Republic and early Empire. Farm sizes in Rome can be divided into three categories. Small farms were from 18–108 iugera. (One iugerum was equal to about 0.65 acres or a quarter of a hectare). Medium-sized farms were from 80–500 iugera. Large estates (called latifundia) were over 500 iugera. In the late Republican era, the number of latifundia increased. Wealthy Romans bought land from peasant farmers who could no longer make a living. Starting in 200 BC, the Punic Wars called peasant farmers away to fight for longer periods of time. Cows provided milk while oxen and mules did the heavy work on the farm. Sheep and goats were cheese producers and were prized for their hides. Horses were not widely used in farming, but were raised by the rich for racing or war. Sugar production centered on beekeeping, and some Romans raised snails as luxury food. The Romans had four systems of farm management: direct work by owner and his family; tenant farming or sharecropping in which the owner and a tenant divide up a farm's produce; forced labour by slaves owned by aristocrats and supervised by slave managers; and other arrangements in which a farm was leased to a tenant. 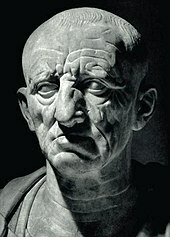 Cato the Elder (also known as "Cato the Censor") was a politician and statesman in the mid-to-late Roman Republic and described his view of a farm of 100 iugera. He claimed such a farm should have "a foreman, a foreman's wife, ten laborers, one ox driver, one donkey driver, one man in charge of the willow grove, one swineherd, in all sixteen persons; two oxen, two donkeys for wagon work, one donkey for the mill work." He also said that such a farm should have "three presses fully equipped, storage jars in which five vintages amounting to eight hundred cullei can be stored, twenty storage jars for wine-press refuse, twenty for grain, separate coverings for the jars, six fiber-covered half amphorae, four fiber-covered amphorae, two funnels, three basketwork strainers, [and] three strainers to dip up the flower, ten jars for [handling] the wine juice..."
There was much commerce between the provinces of the empire, and all regions of the empire were largely economically interdependent. Some provinces specialized in the production of grains including wheat, emmer, spelt, barley, and millet; others in wine and others in olive oil, depending on the soil type. Columella writes in his Res Rustica, "Soil that is heavy, chalky, and wet is not unsuited to the growing for winter wheat and spelt. Barley tolerates no place except one that is loose and dry." Pliny the Elder wrote extensively about agriculture in his Naturalis Historia from books XII to XIX, including chapter XVIII, The Natural History of Grain. Greek geographer Strabo considered the Po Valley (northern Italy) to be the most important economically because "all cereals do well, but the yield from millet is exceptional, because the soil is so well watered." The province of Etruria had heavy soil good for wheat. Volcanic soil in Campania made it well-suited for wine production. In addition to knowledge of different soil categories, the Romans also took interest in what type of manure was best for the soil. The best was poultry manure, and cow manure one of the worst. Sheep and goat manure were also good. Donkey manure was best for immediate use, while horse manure wasn't good for grain crops, but according to Marcus Terentius Varro, it was very good for meadows because 'it promotes a heavy growth of grass plants like grass.'" In the grain-growing area of north Africa (centered on the ancient city of Carthage, a family of six people needed to cultivate 12 iugera/ 3 hectares of land to meet minimum food requirements (without animals). If a family owned animals to help cultivate land, then 20 iugera was needed. More land would be required to meet subsistence levels if the family farmed as sharecroppers. In Africa Proconsularis in the 2nd century AD, one-third of the total crop went to the landowner as rent (See Lex Manciana). Such figures detail only the subsistence level. It is clear that large scale surplus production was undertaken in some provinces, such as to supply the cities, especially Rome, with grain, a process known as the Cura Annonae. Egypt, northern Africa, and Sicily were the principal sources of grain to feed the population of Rome, estimated at one million people at its peak. Average wheat yields per year in the 3rd decade of the century, sowing 135 kg/ha of seed, were around 1,200 kg/ha in Italy and Sicily, 1,710 kg/ha in Egypt, 269 kg/ha in Cyrenaica, Tunisia at 400 kg/ha, and Algeria at 540 kg/ha, Greece at 620 kg/ha. This makes the Mediterranean very difficult to average over all. An agricultural unit was known as a latus fundus mentioned by Varro as a great estate. Which can be interpreted as a Latifundia or at 500 iugera or around 125 hectares because this is the land limit imposed by Tiberius Sempronius Gracchus as tribune in 133 BCE. Egypt was also important in providing wheat to Rome. Normally, shipments of Egyptian wheat may have amounted to 20 million modii or more annually. This number can be found in the Epitome de Caesaribus. Twenty million modii of wheat was enough for half or two thirds of Rome. Pliny the Younger painted a picture that Rome was able to survive without Egyptian wheat in his speech the Panegyricus in 100 AD. In 99 there was an Egyptian crisis due to inadequate flooding. Pliny the Younger stated that for "long it was generally believed that Rome could only be fed and maintained with Egyptian aid". However, he argued that "Now [that] we have returned the Nile its riches... her business is not to allow us food but to pay a proper tribute. The Romans improved crop growing by watering growing plants using aqueducts. An increasing amount of evidence suggests that some parts of the industry were mechanized. For example, extensive sets of mills existed in Gaul and Rome at an early date to grind wheat into flour. 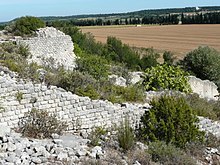 The most impressive extant remains occur at Barbegal in southern France, near Arles. Sixteen overshot water wheels arranged in two columns were fed by the main aqueduct to Arles, the outflow from one being the supply to the next one down in the series. The mills apparently operated from the end of the 1st century AD until about the end of the 3rd century. The capacity of the mills has been estimated at 4.5 tons of flour per day, sufficient to supply enough bread for the 12,500 inhabitants occupying the town of Arelate at that time. Vertical water wheels were well known to the Romans, described by Vitruvius in his De Architectura of 25 BC, and mentioned by Pliny the Elder in his Naturalis Historia of AD 77. There are also later references to floating water mills from Byzantium and to sawmills on the river Moselle by the poet Ausonius. The use of multiple stacked sequences of reverse overshot water-wheels was widespread in Roman mines. 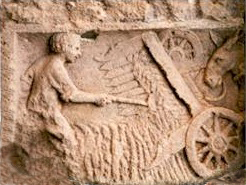 There is evidence from bas-reliefs that farmers in northern Gaul (present day France) used a kind of automatic harvester or reaper when collecting ripe grain crops. The machine, called the "vallus" or "gallic vallus", was apparently invented and used by the Treveri people. It cut the ears of grain without the straw and was pushed by oxen or horses. Pliny the Elder mentions the device in the Naturalis Historia XVIII, 296. Possibly because the vallus was cumbersome and expensive, its adoption never became widespread and it fell into disuse after the 4th century CE. Scythes and sickles were the usual tools for harvesting crops. Aristocrats and common people could acquire land for a farm in one of three ways. The most common way to gain land was to purchase the land. Though some lower class citizens did own small pieces of land, they often found it too difficult and expensive to maintain. Because of the many difficulties of owning land, they would sell it to someone in the aristocracy who had the financial backing to support a farm. Though there were some public lands available to the common person for use, aristocrats also tended to purchase those pieces of land, which caused a great deal of tension between the two classes. “Mass eviction of the poor by the rich underlay the political tensions and civil wars of the last century of the Roman Republic.” Another way to acquire land was as a reward for going to war. High ranking soldiers returning from war would often be given small pieces of public land or land in provinces as a way of paying them for their services. The last way to obtain land was through inheritance. A father could leave his land to his family, usually to his son, in the event of his death. Wills were drawn out that specified who would receive the land as a way of ensuring that other citizens did not try to take the land from the family of the deceased. Though some small farms were owned by lower class citizens and soldiers, much of the land was controlled by the noble class of Rome. Land ownership was just one of many distinctions that set the aristocracy apart from the lower classes. Aristocracy would "reorganize small holdings into larger more profitable farms in order to compete with other nobles." It was considered a point of pride to own not just the largest piece of land, but also to have land that grew high quality produce. As Marcus Cato wrote "when they would praise a worthy man their praise took this form: 'Good husband good farmer'; it is from the farming class that the bravest men and the sturdiest soldiers come." The farms would produce a variety of crops depending on the season, and focused on trying to acquire the best possible farm under the best possible conditions. Cato discusses many of the primary focuses of the farmer and how to distinguish a great piece of land. He notes that a good farmer must take precious time to examine the land, looking over every detail. Not only did the land need to be perfect for purchase, but the neighbors must maintain their farms as well because "if the district was good, they should be well kept." Individuals looking to buy a piece of land had to also take into consideration the weather of the area, the condition of the soil, and how close the farm would be to a town or port. Careful planning went into every detail of owning and maintaining a farm in Roman culture. While the aristocracy owned most of the land in Rome, they often were not present at the farms. With obligations as senators, generals, and soldiers at war, many of the actual landowners spent very little time working on their farms. The farms instead were maintained by slaves and freedmen paid to oversee those slaves. The overseer of the farm had many responsibilities that coincided with maintaining the land. He was responsible for ensuring that the slaves were kept busy and for resolving conflicts between them. An overseer had to be dependable and trustworthy in that the land owner had to know that the person he hired to run the farm was not going to try to steal any of the produce from the farm. Overseers were also responsible for ensuring that both servants and slaves were properly fed and housed, and that they were assigned work fairly and efficiently. They had to ensure that any orders given by the owner of the land were followed diligently and that everyone on the farm honored the gods completely and respectfully, which Romans believed was necessary to ensure a bountiful harvest. Good inscription evidence of how the system was organized is visible in the Lex Manciana. The majority of the work was done by servants and slaves. Slaves were the main source of labor. In Roman society, there were three main ways to obtain a slave. The first and possibly most common way to gain a slave was to buy one on the market. Slaves were purchased at auctions and slaves markets from dealers or were traded between individual slave owners. Another way slaves were acquired was through conquest in warfare. As Keith Hopkins explains in his writings, many landowners would go to war and bring back captives. These captives were then taken back to Roman territory and either sold to another citizen or made to work on the capturer's farm. The final way a slave could be obtained was through birth: if a female slave gave birth to a child, that child became property of the slave's owner. Extramarital relations with women who were not citizens was not considered to be adultery under Roman law (and Roman wives were expected to tolerate such behavior), so there was no legal or moral impediment to having children being fathered by a slave's owner or overseer. Slaves were relatively cheap to use because they were property; their treatment depended on the humanity of their owners, who met the needs of their slaves on what they cared to spend, not what they had to. Overseers motivated slaves by imposing punishments and by giving rewards. "If the overseer sets his face against wrongdoing, they will not do it; if he allows it, the master must not let him go unpunished." Although outright cruelty to slaves was considered a mark of bad character in Roman culture, there were few limits on the punishments an overseer or slave-owner could inflict. Roman agricultural practices may have contributed to soil depletion throughout the Roman world. ^ a b c d e f g Hopkins (1978). Conquerors and Slaves. New York: Cambridge University Press. pp. 1–9. ISBN 978-0521219457. ^ Rosenstein, Nathan (2013), "Agriculture, Roman Republic," Encyclopedia of Ancient History, https://onlinelibrary.wiley.com/doi/pdf/10.1002/9781444338386.wbeah20007, Accessed 9 Nov 2018. ^ Jasy, Naum (1950), "The daily bread of the Ancient Greeks and Romans," Ostria,, Vol. 9, pp. 231-233. Downloaded from JSTOR. ^ Casson, Lionel (1991), The Ancient Mariners, Princeton: Princeton University Press, pl 200. ^ Henderson, John (2004). Roman Book of Gardening. London: Routledge. pp. 40–65. ISBN 978-0415324496. ^ Howatson, M. C. (1989). The Oxford Companion to Classical Literature. Oxford University Press. pp. 17–19. ISBN 978-0198661214. ^ a b c d White, K. D. (1970). Roman Farming. Cornell University Press. ISBN 978-0801405754. ^ Cornell, Tim (1982). Atlas of the Roman World. Facts on File. p. 55. ^ "Pliny the Elder, the Natural History, BOOK I". ^ a b Kehoe, D. (1988). Economics of Agriculture on Roman Imperial Estates in North Africa. Göttingen: Vandenhoeck & Ruprecht. ISBN 978-3525251881. ^ Rickman, G.E. (1980). "The Grain Trade Under the Roman Empire". Memoirs from the American Academy in Rome. 36: 263, 264. . Downloaded from JSTOR. ^ Green, C. M. C. (1997). "Free as a Bird: Varro de re Rustica 3". American Journal of Philology. 118 (3): 427–448. doi:10.1353/ajp.1997.0040. ^ Erdkamp, P. (2005). The Grain Market In The Roman Empire: A Social, Political And Economic Study. Cambridge University Press. ISBN 978-0521838788. ^ Ligt, Luuk de; Northwood, S. J. (2008-01-01). People, Land, and Politics: Demographic Developments and the Transformation of Roman Italy 300 BC-AD 14. BRILL. ISBN 978-9004171183. ^ a b Erdkamp, Paul (2005). The Grain Market in the Roman Empire. Cambridge University Press. pp. 42–44, 49, 243, quote on page 228. ISBN 978-0521838788. ^ Finley, M. I. (1973). The Ancient Economy. Berkeley: University of California. p. 62. ISBN 978-0520024366. a slave is property, subject to the rules and procedures of property, with respect to sale, lease, theft, natural increase and so on. ^ Kevin Greene, The Archaeology of the Roman Economy, p. 85. Buck, Robert J. Agriculture and Agricultural Practice In Roman Law. Wiesbaden: F. Steiner, 1983. Erdkamp, Paul. The Grain Market In the Roman Empire: A Social, Political and Economic Study. Cambridge, UK: Cambridge University Press, 2005. Horden, P., and N. Purcell. The corrupting sea: A study of Mediterranean history. Oxford: Blackwell, 2000. Kehoe, D. P. Investment, profit, and tenancy: The jurists and the Roman agrarian economy. Ann Arbor: Univ. of Michigan Press, 1997. Reynolds, P. Hispania and the Roman Mediterranean AD 100–700: Ceramics and trade. London: Duckworth, 2010. Spurr, M. S. "Arable cultivation in Roman Italy: c. 200 B.C.–c. A.D. 100." Journal of Roman Studies Monographs 3. London: Society for the Promotion of Roman Studies, 1986. White, K. D. Roman Farming. Ithaca, NY: Cornell University Press, 1970. --. Farm Equipment of the Roman World. Cambridge, UK: Cambridge University Press, 1975. Cato, Marcus Porcius. Cato, the Censor, On Farming. Translated by Ernest Brehaut. New York: Columbia University Press, 1933. Columella, Lucius Junius Moderatus. On Agriculture. Translated by Harrison Boyd Ash. Cambridge, MA: Harvard University Press, 1941.